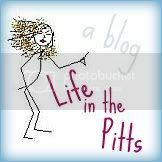 Life in the Pitts: I just stood there. I'd probably wanna say "I'd buy some face cream, cos your face is looking wrinkly, oh wait You're just OLD!!! Oh my gosh, I'd want to cry, too! What a horrible thing to say! I would be speechless, like I am now. I'd poke out my tounge, pull out my ears, and wiggle my nose. Just to match his maturity. On some days I'd be too flabbergasted to say anything at all. On other days, if I was on my game, I'd comment on how pitiable it was for someone who'd had such a long life to have wasted it on such misery that he needed to put someone down to feel better about himself. At least the space you take up isn't wasted. Oh my word - that is horrible!! For the last few months my family has been asking me if im pregant - when they know im not having more kids!! its awful when people take it upon themselves to comment on your looks like that im so sorry! !